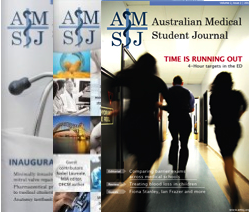 Sean Davies is a final year Medical student at Monash University. He is particularly interested in trauma and retrieval medicine and has aspirations to work overseas in humanitarian medical aid in the future. Rapid sequence induction (RSI) is a technique used to facilitate endotracheal intubation in patients at high risk of aspiration and for those who require rapid securing of the airway. In Australia, RSI protocols in emergency departments usually dictate a predetermined dose of an induction agent and a neuromuscular blocker given in rapid succession. Suxamethonium, also known as succinylcholine, is a depolarising neuromuscular blocker (NMB) and is commonly used in RSI. Although it has a long history of use and is known for producing good intubating conditions in minimal time, suxamethonium possesses certain serious side effects and contraindications (that are beyond the scope of this article). If there existed no alternative NMB, then the contraindications associated with suxamethonium would be irrelevant – yet there exists a suitable alternative. Rocuronium, a non-depolarising NMB introduced into Australia in 1996, has no known serious side effects or contraindications (excluding anaphylaxis). Unfortunately, many myths surrounding the properties of rocuronium have propagated through the anaesthesia and emergency medicine communities, and have resulted in some clinicians remaining hesitant to embrace this drug as a suitable alternative to suxamethonium for RSI. This essay aims to dispel a number of these myths through presenting the evidence currently available and thus allowing physicians to make informed clinical decisions that have the potential to significantly alter patient outcomes. It is not intended to provide a clear answer to the choice of NMB in RSI, but rather to encourage further debate and discussion on this controversial topic under the guidance of evidence-based medicine. One of the more noteworthy differences between these two pharmacological agents is their duration of action. The paralysis induced by suxamethonium lasts for five to ten minutes, while rocuronium has a duration of action of 30-90 minutes, depending on the dose used. The significantly shorter duration of action of suxamethonium is often quoted by clinicians as being of great significance in their decision to utilise this drug. In fact, some clinicians are of the opinion that by using suxamethonium, they insert a certain ‘safety margin’ into the RSI protocol under the belief that the NMB will ‘wear off ’ in time for the patient to begin spontaneously breathing again in the case of a failed intubation. Benumof et al. (1997)  explored this concept by methodically analysing the extent of haemoglobin desaturation (SpO2) following administration of suxamethonium 1.0mg/kg in patients with a non-patent airway. This study found that critical haemoglobin desaturation will occur prior to functional recovery (that is, return of spontaneous breathing). In 2001, a study by Heier et al. was conducted, involving twelve healthy volunteers aged 18 to 45 years who were all pre-oxygenated to an end-tidal oxygen concentration >90% (after breathing a FiO2 of 1.0 for three minutes). Following the administration of thiopental and suxamethonium 1.0mg/kg, no assisted ventilation was provided and the oxygen saturation levels were closely monitored. The results demonstrated that one third of the patients included in the study desaturated to SpO2 <80% (at which point they received assisted ventilation during the trial). As the authors clearly stated, the study participants were all young, healthy and slim individuals who received optimal pre-oxygenation, yet still a significant proportion suff ered critical haemoglobin desaturation before spontaneous ventilationresumed. In a real-life scenario, particularly in the patient population who require RSI, an even higher number of patients would be expected to display significant desaturation due to their failing health and the limited time available to provide pre-oxygenation. Although one may be inclined to argue that the results would be altered by reducing the dose of suxamethonium, Naguib et al. affirmed that, while reducing the dose from 1.0mg/kg to 0.6mg/kg did slightly reduce the incidence of SpO2 <90% (from 85% to 65%), it did not shorten the time to spontaneous diaphragmatic movements. Therefore, the notion that the short duration of action of suxamethonium can be relied upon to improve safety in RSI is not supported and should not be trusted as a reliable means to rescue a “cannot intubate, cannot ventilate” situation. Having demonstrated that differences in the duration of action should not sway one in the false belief of improving safety in RSI, let us compare the effect of the two drugs on oxygen saturation levels if apnoea was to occur following their administration. As suxamethonium is a depolarising agent, it has the side effect of muscle fasciculations following administration, whereas rocuronium, a non-depolarising agent, does not. It has long been questioned whether or not the existence of fasciculations associated with the use of suxamethonium alters the time to onset of haemoglobin desaturation if the airway was unable to be secure in a timely fashion and thus prolonged apnoea occurred. This concept was explored by Taha et al. who divided enrolled participants in the study into three groups: lidocaine/fentanyl/ rocuronium, lidocaine/fentanyl/suxamethonium and propofol/ suxamethonium. Upon measuring the time to onset of haemoglobin desaturation (deemed to be SpO2 <95%), it was discovered that both groups receiving suxamethonium developed significantly faster desaturation than the group receiving rocuronium. By analysing the differences between the two groups receiving suxamethonium, one discovers a considerable difference in results, with the lidocaine/ fentanyl group having a longer onset to desaturation than the propofol group. Since lidocaine and fentanyl are recognised to decrease (but not completely attenuate) the intensity of suxamethonium-induced fasciculations, these results suggested that the fasciculations associated with suxamethonium do result in a quicker onset to desaturation compared to rocuronium. Another recent study by Tang et al. provides further clarification on this topic. Overweight patients with a BMI of 25-30 who were undergoing elective surgery requiring RSI were enrolled in the study. Patients were given either 1.5mg/kg suxamethonium or 0.9mg/ kg rocuronium and no assisted ventilation was provided following induction until SpO2 <92% (designated as the ‘Safe Apnoea Time’). The time taken for this to occur was measured in conjunction with the time required to return the patient to SpO2 >97% following introduction of assisted ventilation with FiO2 of 1.0. The authors concluded that suxamethonium not only made the ‘Safe Apnoea Time’ shorter but also prolonged the recovery time to SpO2 >97% compared to rocuronium. In summary, current evidence suggests that the use of suxamethonium results in a faster onset of haemoglobin desaturation than rocuronium, most likely due to the increased oxygen requirements associated with muscle fasciculations. Since RSI is typically used in situations where the patient is at high risk of aspiration, the underlying goal is to secure the airway in the minimal amount of time possible. Thus, the time required for the NMB to provide adequate intubating conditions is of great importance, with a shorter time translating into better patient outcomes, assuming all other factors are equal. Suxamethonium has long been regarded as the ‘gold-standard’ in this regard, yet recent evidence suggests that the poor reputation of rocuronium in regards to the time required is primarily due to inadequate dosing. Recommended doses for suxamethonium tend to be reliably stated as 1.0-1.5mg/kg,  whereas rocuronium dosages have often been quoted as 0.6mg/kg, which, as will be established below, is inadequate for use in RSI. A prospective, randomised trial study published by Sluga et al. in 2005 concluded that, upon comparing intubating conditions following administration of either 1.0mg/kg suxamethonium or 0.6mg/kg rocuronium, there was a significant improvement in conditions with suxamethonium at 60 seconds post-administration. Another study  examined the frequency of good and excellent intubating conditions with rocuronium (0.6mg/kg and 1.0mg/kg) or suxamethonium (1.0mg/kg). Upon comparison of the groups receiving rocuronium, the 1.0mg/kg group had a consistently greater frequency of both good and excellent intubating conditions at 50 seconds. While the rocuronium 1.0mg/kg and suxamethonium 1.0mg/kg groups had a similar frequency of acceptable intubating conditions, there was a higher incidence of excellent conditions in the suxamethonium group. A subsequent study  confirmed this finding, with the intubating physician reporting a higher degree of overall satisfaction with the paralysis provided with suxamethonium 1.7mg/kg when compared to rocuronium 1.0mg/kg. In other words, it appears that the higher dose of 1.0mg/kg of rocuronium produces better intubating conditions than 0.6mg/kg, yet it does not do so to the same extent as suxamethonium. The question that needs to be posed is whether this is truly an advantage of a NMB used in RSI. Patients who require emergency intubation often have a dire need for a secure airway to be established – simply allowing the NMB to “wear off ” and the patient to begin spontaneously breathing again does nothing to alter their situation. 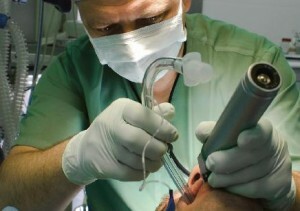 One must consider that, even if the clinician was aware of the evidence against relying on suxamethonium’s short duration of action to rescue them from a failed intubation scenario, the decision to initiate further measures (that is, progress to a surgical airway) would be delayed in such a scenario. If rocuronium, with its longer duration of action, was used, would clinicians then feel more compelled to ‘act’ rather than ‘wait’ in this rare scenario, knowing that the patient would remain paralysed? If rescue techniques such as a surgical airway were instigated, would the awakening of the patient (due to suxamethonium terminating its effect) be a hindrance? Although the use of rocuronium presents the risk of a patient requiring prolonged measures to maintain oxygenation and ventilation in a “cannot intubate, can ventilate” scenario, paralysis would be reliably maintained if a surgical airway was required. No discussion on the debate of suxamethonium versus rocuronium would be complete without mentioning a new drug that appears to hold great potential in this arena – sugammadex. A γ-cyclodextrin specifically designed to encapsulate rocuronium and thus cause disassociation from the acetylcholine receptor, it acts to reverse the effects of neuromuscular blockade from rocuronium. In addition to its action on rocuronium, sugammadex also appears to have some crossover effect on vecuronium, another steroidal non-depolarising NMB. While acetylcholinesterase inhibitors are often used to reverse NMBs, they act non-specifically on both muscarinic and nicotinic synapses and cause many unwanted side effects. If they are given before there is partial recovery (>10% twitch activity) of neuromuscular blockade, they do not shorten the time to 90% recovery and thus are ineffective against profound block. Sugammadex was first administered to human volunteers in 2005 with minimal side effects. It displayed great potential in achieving quick recovery from rocuronium-induced paralysis within a few minutes. Further trials were conducted, including by de Boer et al. in the Netherlands. Neuromuscular blockade was induced with rocuronium 1.2mg/kg and doses ranging from 2.0 to 16.0mg/kg of sugammadex given. With recovery of the train-of-four ratio to 0.9 designated as the primary outcome, the authors found that successive increases in the dose of sugammadex resulted in decreased time required to reverse profound blockade at five minutes following administration of rocuronium, with sugammadex 16mg/kg giving a mean recovery time of only 1.9 minutes compared to the placebo recovery time of 122.1 minutes. In a review article, Mirakhur  further supported the use of high-dose sugammadex (16mg/kg) in a situation requiring rapid recovery of neuromuscular blockade. With an effective reversal agent for rocuronium presenting a possible alternative to suxamethonium in rapid sequence inductions, Lee et al. closely examined the differences in time to termination of effect. They studied 110 patients randomised to either rocuronium 1.2mg/kg or suxamethonium 1mg/kg. At three minutes following administration of rocuronium, 16mg/kg sugammadex was given. The results of this study confirmed the potential of sugammadex and its possible future role in RSI, as the study group given rocuronium and sugammadex (at three minutes) recovered significantly faster than those given suxamethonium (mean recovery time to first twitch 10% = 4.4 and 7.1 minutes respectively). The evidence therefore suggested that administering sugammadex 16mg/kg at three minutes after rocuronium 1.2mg/kg resulted in a shorter time to reversal of neuromuscular blockade compared to spontaneous recovery with suxamethonium. While sugammadex has certainly shown great potential, it remains an expensive drug and there still exist uncertainties regarding repeat dosing with rocuronium following reversal with sugammadex,  as well as the need to suitably educate and train staff on its appropriate use, as demonstrated by Bisschops et al. It is also important to note that for sugammadex to be of use in situations where reversal of neuromuscular blockade is required, the full reversal dose (16mg/kg) must be readily available. Nonetheless, it appears as if sugammadex may revolutionise the use of rocuronium not only in RSI, but also for other forms of anaesthesia in the near future. As clinicians, we should strive to achieve the best patient outcomes possible. Without remaining abreast of the current literature, our exposure to new therapies will be limited and, ultimately, patients will not always be provided with the high level of medical care they desire and deserve. I urge all clinicians who are tasked with the difficult responsibility of establishing an emergency airway with RSI to consider rocuronium as a viable alternative to suxamethonium and to strive to understand the pros and cons associated with both agents, in order to ensure that an appropriate choice is made on the basis of solid evidence-based medicine. Benumof JL, Dagg R, Benumof R. Critical haemoglobin desaturation will occur before return to an unparalysed state following 1 mg/kg intravenous succinylcholine. Anesthesiology. 1997; 87:979-82. Heier T, Feiner JR, Lin J, Brown R, Caldwell JE. Hemoglobin desaturation after succinylcholine-induced apnea. Anesthesiology. 2001; 94:754-9. Neguib M, Samarkandi AH, Abdullah K, Riad W, Alharby SW. Succinylcholine dosage and apnea-induced haemoglobin desaturation in patients. Anesthesiology. 2005; 102(1):35-40. Taha SK, El-Khatib MF, Baraka, AS, Haidar YA, Abdallah FW, Zbeidy RA, Siddik-Sayyid SM. Effect of suxamethonium vs rocuronium on onset of oxygen saturation during apnoea following rapid sequence induction. Anaesthesia. 2010; 65:358-361. Tang L, Li S, Huang S, Ma H, Wang Z. Desaturation following rapid sequence induction using succinylcholine vs. rocuronium in overweight patients. Acta Anaesthesiol Scand. 2011; 55:203-8. El-Orbany M, Connolly LA. Rapid Sequence Induction and Intubation: Current Controversy. Anaesth Analg. 2010; 110(5):1318-24. Sluga M, Ummenhofer W, Studer W, Siegemund M, Marsch SC. Rocuronium versus succinylcholine for rapid sequence induction of anesthesia and endotracheal intubation a prospective, randomized trial in emergent cases. Anaesth Analg. 2005; 101:1356-61. McCourt KC, Salmela L, Mirakhur RK, Carroll M, Mäkinen MT, Kansanaho M, Kerr C, Roest GJ, Olkkola KT. Comparison of rocuronium and suxamethonium for use during rapid sequence induction of anaesthesia. Anaesthesia. 1998; 53:867-71. Laurin EG, Sakles JC, Panacek EA, Rantapaa AA, Redd J. A comparison of succinylcholine and rocuronium for rapid-sequence intubation of emergency department patients. Acad Emerg Med. 2000; 7:1362-9. Patanwala AE, Stahle SA, Sakles JC, Erstad BL. Comparison of Succinylcholine and Rocuronium for First-attempt Intubation Success in the Emergency Department. Acad Emerg Med. 2011; 18:11-14. Perry JJ, Lee JS, Sillberg VAH, Wells GA. Rocuronium versus succinylcholine for rapid sequence induction intubation. Cochrane Database Syst Rev. 2008:CD002788. Rose M, Fisher M. Rocuronium: high risk for anaphylaxis? Br J Anaesth. 2001; 86(5):678-82. Florvaag E, Johansson SGO. The pholcodine story. Immunol Allergy Clinic North Am. 2009; 29:419-27. Gijsenbergh F, Ramael S, Houwing N, van Iersel T. First human exposure of Org 25969, a novel agent to reverse the action of rocuronium bromide. Anaesthesiology. 2005; 103:695- 703. De Boer HD, Driessen JJ, Marcus MA, Kerkkamp H, Heeringa M, Klimek M. Reversal of rocuronium-induced (1.2 mg/kg) profound neuromuscular block by sugammadex. Anesthesiology. 2007; 107:239-44. Mirakhur RK. Sugammadex in clinical practice. Anaesthesia. 2009; 64:45-54. Lee C, Jahr JS, CandiottKA, Warriner B, Zornow MH, Naguib M. Reversal of profound neuromuscular block by sugammadex administered three minutes after rocuronium. Anesthesiology. 2009; 110:1020-5. Cammu G, de Kam PJ, De Graeve K, van den Heuvel M, Suy K, Morias K, Foubert L, Grobara P, Peeters P. Repeat dosing of rocuronium 1.2 mg/kg after reversal of neuromuscular block by sugammadex 4.0 mg/kg in anaesthetized healthy volunteers: a modelling-based pilot study. British Journal of Anaesthesia. 2010; 105(4):487-92. Bisschops MM, Holleman C, Huitink JM. Can sugammadex save a patient in a simulated ‘cannot intubate, cannot ventilate’ situation? Anaesthesia. 2010; 65:936-41.